Introduction: A systematic review was conducted to review the effectiveness of workplace-based return-to-work (RTW) interventions. Method: Seven databases were searched, in English and French, between January 1990 and December 2003 for peer-reviewed studies of RTW interventions provided at the workplace to workers with work disability associated with musculoskeletal or other pain-related conditions. Methodological quality appraisal and data extraction were conducted by pairs of reviewers. Results: Of a total of 4124 papers identified by the search, 10 studies were of sufficient quality to be included in the review. 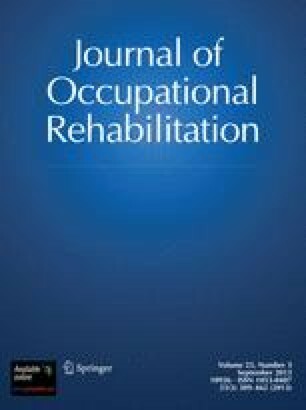 There was strong evidence that work disability duration is significantly reduced by work accommodation offers and contact between healthcare provider and workplace; and moderate evidence that it is reduced by interventions which include early contact with worker by workplace, ergonomic work site visits, and presence of a RTW coordinator. For these five intervention components, there was moderate evidence that they reduce costs associated with work disability duration. Evidence for sustainability of these effects was insufficient or limited. Evidence regarding the impact of supernumerary replacements was insufficient. Evidence levels regarding the impact of the intervention components on quality-of-life was insufficient or mixed. Conclusions: Our systematic review provides the evidence base supporting that workplace-based RTW interventions can reduce work disability duration and associated costs, however the evidence regarding their impact on quality-of-life outcomes was much weaker. Donald Cole, Jeremy Dacombe, Jaime Guzman, Sheilah Hogg-Johnson, Ellen MacEachen, Victoria Pennick, Anusha Raj, Rhoda Reardon, Dwayne Van Eerd.